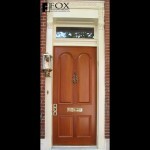 This is a set of solid mahogany patio doors. 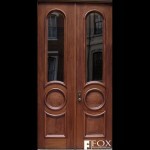 There are two pairs of bifold doors. When opened, the entire 8' wide space is open. This creates a confluence of interior and exterior spaces to allow for easy use of the kitchenette inside. 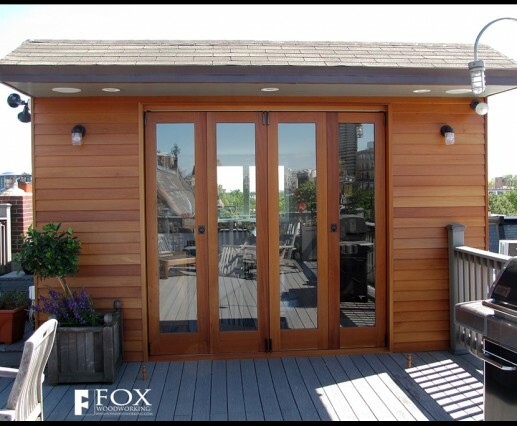 With the addition of the ship lap siding on either side of the mahogany patio doors, the entire wall is covered with mahogany. This deck is on top of a three-story home near Rittenhouse Square and has great views of Philadelphia.